So you’d think Weiss and his crew would be a little more circumspect about accusing a far more serious Syria analyst like Tamimi of being a jihadist sympathizer—but hypocrisy never bothered a neocon. And anyway, their gang hit on Tamimi’s reputation had nothing to do with jihadi sympathies, and everything to do with making Weiss look bad. 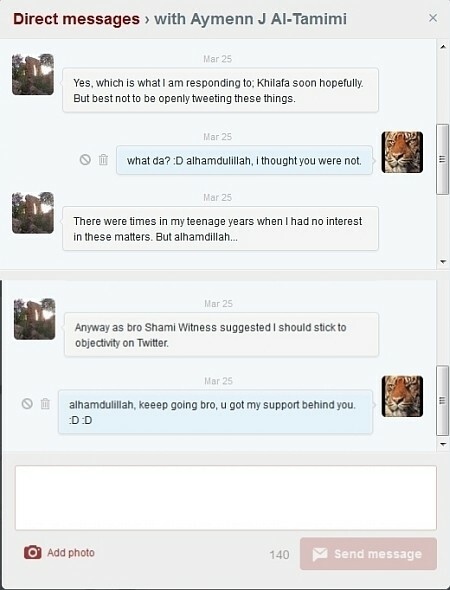 So the syndicate took a break from brand-building with ShamiWitness, to try to sink Tamimi’s career by smearing him as a terrorist symp. The job was handed to an aspiring young neocon larva named Armin Rosen — previously known for defendinga racist hate-group leader’s use of “Islamo-fascism” — who published the hit piece in Business Insider, headlined “The Remarkable Story of a Rising Terrorism Analyst Who Got Too Close To His Subjects”. This is a classic neocon smear strategy—activate the network to create the impression that the character smear is a consensus opinion by experts from different backgrounds, and drive the stake in the heart with a retraction. In this case, Bellingcat’s Eliot Higgins played executioner in the Tamimi smear. Higgins and his Bellingcat crew have come a long way since this smear on Tamimi. These days, Bellingcat are media celebrities, fronting for western intelligence agencies’ information wars against Russia and Syria. Eliot Higgins and Bellingcat have positioned themselves as a “pro-NATO Wikileaks” exposing the lies and crimes of NATO’s adversaries, racking up lucrative grants from Google, the Atlantic Council, and Bill Casey’s old regime-change front, the National Endowment for Democracy, along the way. So people in Syria and Iraq were killed, kidnapped, tortured and raped. And ShamiWitness is rotting in an Indian prison somewhere. That’s not theirproblem. Eliot Higgins and Michael Weiss have moved on to bigger things now. Their power network is a lot bigger too. And they can prove beyond a doubt that if you question their research, you might be working for the enemy. Why else would anyone question their expertise?